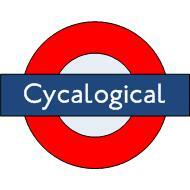 CycaLogical: Going Dutch - The Fightback Begins? Going Dutch - The Fightback Begins? LCC has at long last come around to the idea of segregated space with its 'Going Dutch' campaign. It was only a matter of time before there was a counter-campaign by those whose vehicular cycling outlook until recently held sway. Hence a post by Matthew Wright in the Guardian's cycling blog. Wright doesn't go all-out to say that segregation is a bad idea. He starts by pointing out that in Holland "cycling facilities were so good that their use was obligatory and enforced by police". This is an allusion to the well-worn argument that the provision of segregated paths will whittle away at the cyclist's right to use roads. Fair enough if you like cycling on roads, but most people don't, which is why almost no-one (except me and you, dear readers) cycles in the UK. "The safety of having separate lanes has often been questioned. Though there are many variables, and conclusions are contested, most studies suggest that separate paths, if anything, make cycling more dangerous, because junctions – where most accidents occur – are more complicated." Are separate paths more dangerous? The research cited appears to be quite old, and any research done in the UK is based on the narrow, badly-designed, badly-maintained, badly-surfaced tracks, regularly punctuated with driveways and side-road junctions, and featuring jaywalking pedestrians, dogs, and the odd parked car. I'm not going to pick through every study because that would be futile - if the Dutch road system with its extensive use of segregated paths has the best safety record, there can't be too much wrong with segregated paths as such. But the reality is, it doesn't matter. Go to Richmond Park on a weekend, and you'll find thousands of people cycling on those dangerous off-road paths, and these are largely people who wouldn't dream of cycling on those safe, fluffy roads because for some bizarre reason they think they're too dangerous. Even if you showed them the statistics, they wouldn't believe you, because there is something inherently sphincter-spasm-inducing about being passed by a 3-tonne van with a couple of inches between its mirrors and your elbow. Nothing short of mass hypnotism will persuade most people to cycle on UK roads, because it feels dangerous, and it's gut feel, not statistics or probabilities, that people rely on to tell them whether something is safe or not. In the simplest possible terms, even if roads are safer than segregated paths, UK road conditions are the biggest deterrent to cycling there could possibly be. And it's UK road conditions that are pushing people into the car-dependent, sedentary lifestyle that is far, far more dangerous than cycling on a segregated path could ever be. Wright then quotes Amsterdamize's Marc van Woudenberg as saying "Segregation is just one (important) part of bicycle policies in the Netherlands, complemented with integral spatial planning, traffic calming, bike facilities and effective traffic laws." Wright continues: "in reducing the Dutch approach to being mainly about paths, LCC is misrepresenting it. Their campaigns for a 20mph speed limit (widespread in the Netherlands), and the crucial issue of strict liability would make a more sensible centrepiece for Go Dutch." So there you have it. Put the word 'Dutch' in front of all the UK cycling campaigns of the past couple of decades that have failed to deliver meaningful growth in cycling, and they will magically succeed and deliver a cycling culture. I live on a 20MPH road, and I avoid cycling on it whenever I can because no-one drives at less than 28MPH unless there's something seriously wrong with their car. 'Integral spatial planning' in London to most people means being able to park your car. Strict liability? Drivers don't go out intending to crash. They already know that a prang will push up their premiums. Read much more about why strict liability is irrelevant here. As David Hembrow (a Dutch-based cycling blogger that Wright doesn't quote, but I will) says: "[Dutch] Strict Liability came only after the majority of people cycled, and when there was already a very high degree of segregation and planning around bicycles." Wright then points out, "LCC's emphasis on 'London's main roads' is also strange...why would you want to cycle in such noise, danger and pollution, when there are faster and more pleasant routes through back streets, parks and towpaths? This kind of route requires only some intelligent planning"
Back-street routes are what we have with the London Cycle Network. Even if you weren't perpetually getting lost on the LCN, it can hardly be described as 'fast'. There are hazards from frequent junctions (and the priority is usually against you), parked cars, and there's significant rat-running traffic to contend with. The phrase 'only some intelligent planning' seems to imply that a couple of weeks work by some contractors will sort it out. But I digress. Why emphasise main roads? Because it's very hard to avoid main roads if you want to follow a reasonably direct route, and you need segregation where there is significant motor traffic. Where traffic levels and speeds are low enough, you don't need segregation. That's how the Dutch do it. If you only use filtered permeability, 'home zones', and greenways to construct a cycling network, you end up with very compromised routes. It is not a vision of mass cycling: it's a vision of mitigation that isn't going to inspire anybody. "the biggest barrier on the road to creating a widespread cycling culture in the UK is tackling speed limits and a pro-motorist legal bias." This is a real chicken-or-egg argument. The reason that speed cameras, speed limits and indeed any restrictions whatever on car use are unpopular in the UK is because we are so car-dependent as a nation, and as a consequence there are a lot more voters who are motorists than there are voters who cycle. Lower speed limits and cycle-friendly traffic laws are consequences of a cycling culture, not prerequisites. It is also a false argument. The biggest barrier to creating a UK cycling culture is the fear of traffic. This is demonstrated in survey after survey. Vehicular campaigners have been trying to civilize motoring for decades, successes have been few and far between, and there's no evidence that fear of traffic has become any less. Freewheeler has already documented why. What is most toxic about opposition to Going Dutch is the fact that if cycling campaigners cannot present a single, compelling vision about how mass cycling can be achieved, then we won't convince the politicians or the public. And the fact is, the public understand segregation: I speak to many people who say they would cycle more if there were cycle paths away from traffic. It almost seems like it's only cycle campaigners who don't 'get it'. There are some nice responses to the Guardian article referred to above being written at the moment - I've just read another good'un by ManchesterCycling - but this is spot on. Thanks.